At one point (heading ring rd>adel, left of woods) I came across a sort of large stone wall structure extending across to my right across the valley. Will take camera & elaborate. What/where/look forward to a piccy!! Here is the working Goit overflow in the Hollies where it operated nearby Weetwood (Paper?) Mill. Empties back into Meanwood Beck. 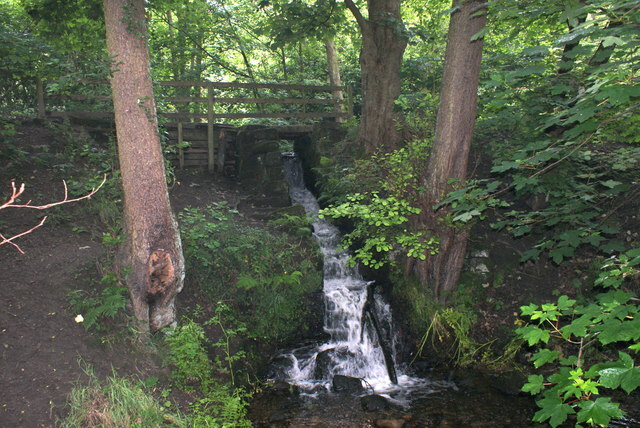 As you point out, there are the same (now redundant) structures in Scotland Wood where the Goit was cut high into the valley side, over the stone-constructed footpath. But note, this is completely separate from the Eccup>Blackhill>7 Arches conduit that was highter still in the valley side. Is that a remnant of the Dam wall? Seems to be where the meanwood valley footpath splits, and Scotland Mill Ln, as was, goes/went across. 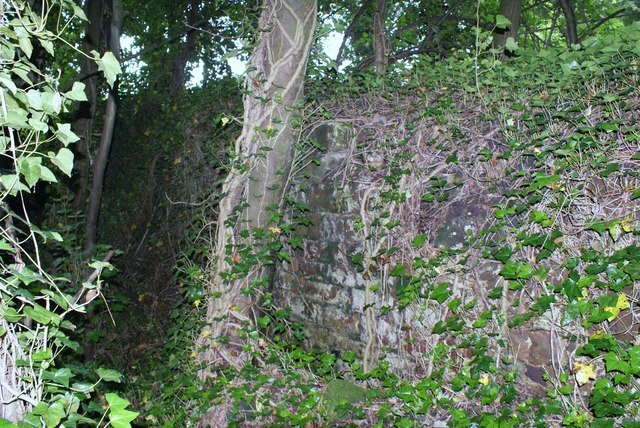 Also next to the large stone, there is some form of tunnel, or perhaps exit route sluice perhaps for the water (enclose, click at page top to view). 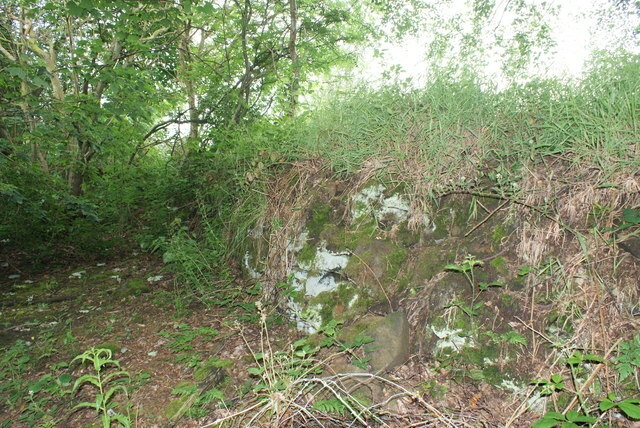 next to the large stone, there is some form of tunnel, or perhaps exit route sluice perhaps for the water (enclose, click at page top to view). I can't make much of the remains of the Mill. Sure the large stone, the arch, the brickwork and the opening below ground level is fascinating. Good idea is to go on old maps and find the oldest largest scale and blow it right up to see. IIRC the leat/goit fed from above and behind the mill - for max power of course - and it therefore may have made it's way out from a level below ground floor. Of course the pathways have all been altered in front of the mill. IIRC I did not find a trace of the outlet to the beck. You may have seen Portillo's Railway Journeys. He covered Marshall albeit at Temple Mills. Meanwood Valley Urban Farm is also worthy of a look/walk having first viewed an old map. It's a sustrans bike route. If you walk from the (free) car park along through the Farm towards Buslingthorpe Ln, Meanwood Beck to your right, the tarmac path is roughly in line with the Mill Goit but higher up to your left. I assume this then 'dropped' to power Buslingthorpe Mills rejoining the Beck there. , the digging and cutting of the Goit provided removed earth + stone to often build a good walkway alongside for maintenance. Is that a remnant of the Dam wall? I posted some photos in this thread on January 8 2011 that I had taken on November 24 2010 of what I subsequently found is the remaining structure of a toilet block close to where Verity's tea room was in Adel Wood. I've passed by a number of times since then but doing so on September 29 2015 I noticed the new looking graffiti on the block. These are 2 photos that I took on September 29 2015 of this urban artwork. I suspect though that is not worth what a Banksy graffiti is, but who knows!